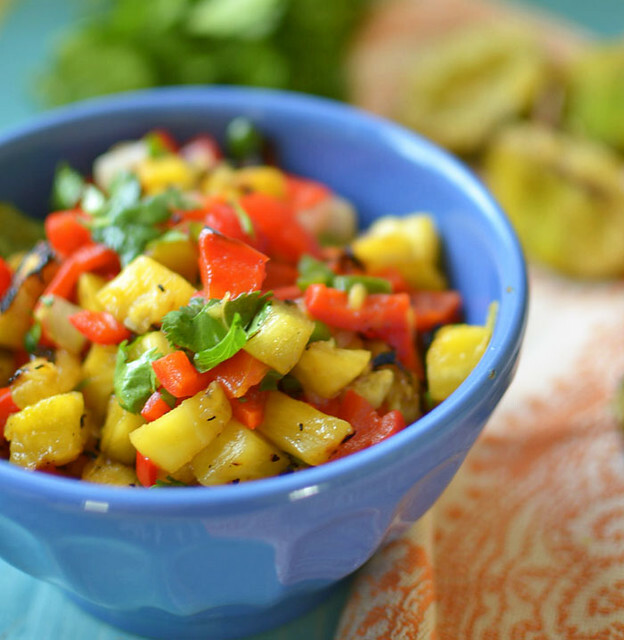 Sweet and smoky grilled pineapple salsa with charred pineapple, jalapeno, peppers and fresh herbs is perfect over grilled salmon for your summer BBQ! Summer is in the air, tan lines are multiplying and the grill is gettin’ hot! We bought a charcoal grill/smoker about a month ago and ever since, we have been hooked! There is no comparison between the taste and smell that hot char-coal gives off compared to it’s gas counter-part. The smell is intoxicating and familiar and screams with memories of summer bbq’s and long days at the beach. We have been hooked ever since and grillin anything we can find outside of our shoe. This week we grilled up some sweet and summery fruit! My mission this summer is to try as many different dishes and ingredients on the grill. I did grill avocados last year which I totally loved. And fruit isn’t too far off on the trend setting menu either. The heat crystallizes all the sugars on the fruit which then forms a crunchy, almost bruleed exterior and the natural sweet fruit juices are just screaming to be enjoyed. So for this dish in particular, we were grilling salmon and I wanted to make something light, summery and full of flavor. Since we were heating the grill up anyway, I threw on a bunch of very ripe produce and chopped it all up. 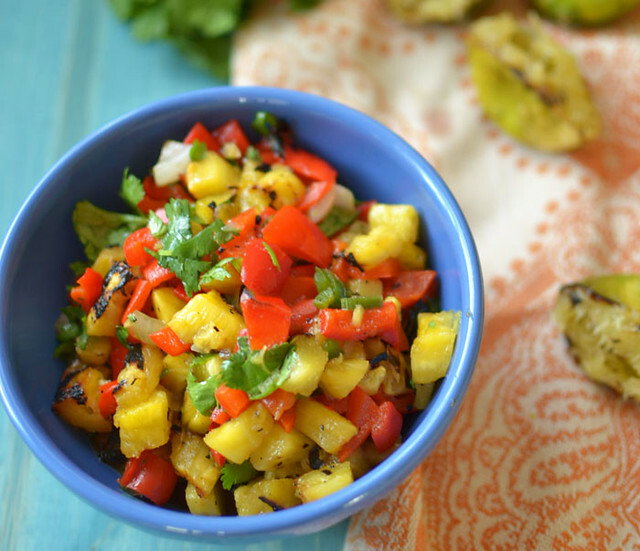 This entire salsa is grilled…even the limes! 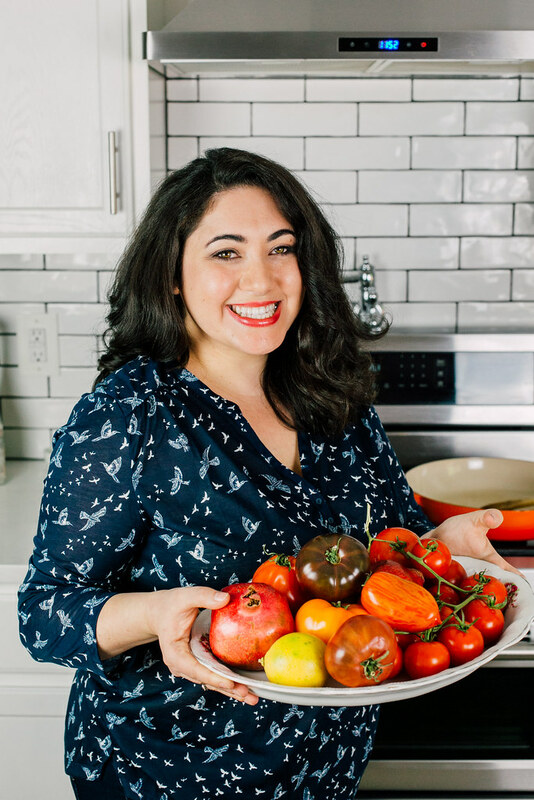 So my question is…….what are YOU grilling this summer? 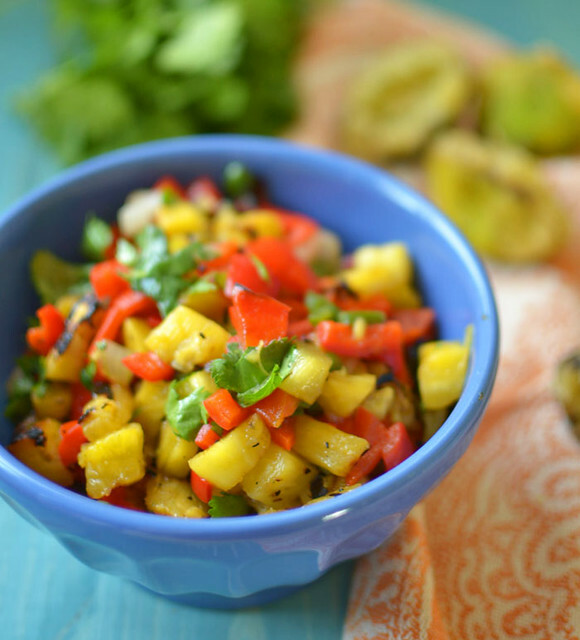 This salsa is fabulous over grilled salmon. Heat your grill until very hot. Drizzle produce lightly with oil and grill on all sides until charred. Grill everything except cilantro. For the bell peppers, after they are grilled, remove the thin skin that will begin to separate from the soft flesh. Chop all ingredients (except lime) into 1/4in pieces and combine in bowl. Add cilantro and squeeze grilled lime juice over salsa. Season with a touch of salt. Allow to sit for at least 20 minutes for flavors to meld.